A premier hotel in one of the world’s most fascinating cities, Habtoor Palace connects guests to Dubai’s best dining, shopping, activities, and attractions. Take a dip in our pools. Splash happy with the kids in family-friendly zones or retreat to a peaceful watery wonderland for adults only. The Roof Gardens is our open-air poolside hangout. 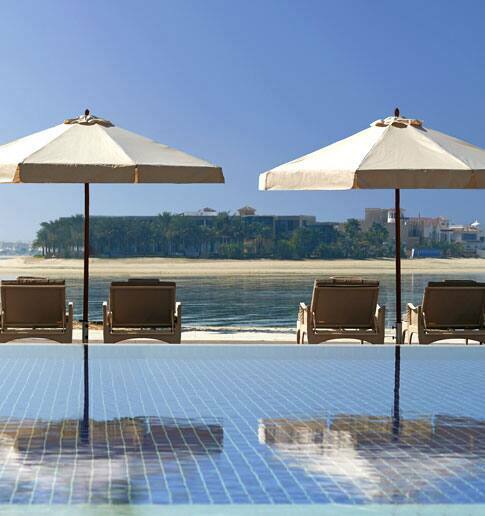 Explore the soft white sands of the 200m private beach of our sister property Waldorf Astoria Dubai Palm Jumeirah. Complimentary for all Habtoor Palace guests, conveniently accessible with our daily shuttle service. 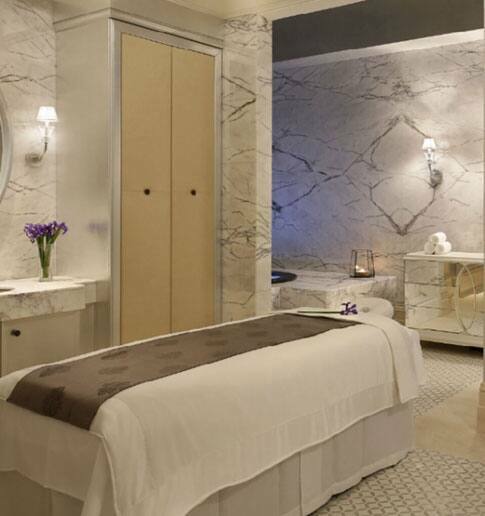 Offering rare and refined services, we provide the finest spa experience imaginable. Welcome to a transcendental world, where each moment provides a lasting impression. Discover services crafted with ancient techniques and scientific expertise. The separate ladies’ and gents’ areas have dedicated wet areas with steam and sauna facilities, two hammams, and a generous relaxation area. 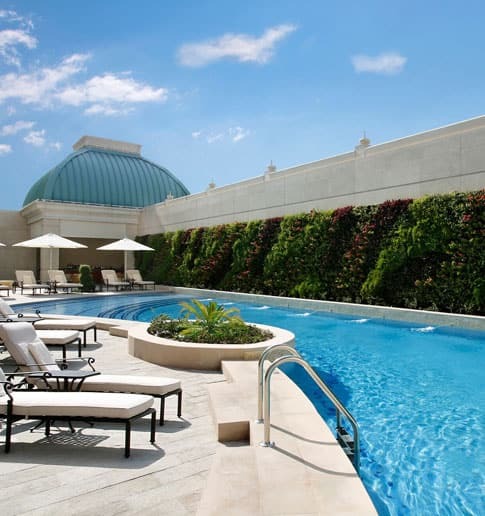 Includes a 60-minute massage, full access to the spa and pool and afternoon tea in Sidra Lounge. Work out when it suits you in our 24-hour fitness center equipped with cardiovascular and strength-training machines. Our experienced team can create customized workouts in tune with your fitness goals. Schedule private and group lessons for all ages and abilities on our three outdoor tennis courts. The adjacent sporting facility is home to the UAE’s first indoor, air-conditioned court for year-round games. Steps away is La Perle Theater, an intimate venue with just over a dozen seating rows. It plays host to unique Las Vegas-style spectaculars above and below water. Guests enjoy two complimentary tickets per reservation. La Perle by Dragone is the region’s first permanent show, located in the heart of Dubai at Al Habtoor City and brought to Dubai by Al Habtoor Group. The show was created by legendary Artistic Director Franco Dragone, famous for his Le Rêve in Las Vegas and The House of Dancing Water in Macau. The show is a breathtaking fusion of immersive artistic performances, imagery, and technology. Influenced by Dubai’s rich culture, vibrant present, and aspirational future, La Perle brings to life awe-inspiring stunts and special effects. The 270-degree seating provides a unique perspective of the tailor-made aqua theater. Witness the stage as it floods with water and drains in seconds as artists perform mind-blowing aqua and aerial feats. Dubai Mall is one of the largest shopping destinations in the world. From intriguing culinary options to child-friendly attractions, it’s a day out for fashionistas, foodies, and families. Go green and see Al Habtoor City from two wheels. We offer nearby bicycle rentals for hotel guests – with bikes, helmets, and accessories for the whole family. The famous Dubai Water Canal is just outside our doors. This local favorite is a beautiful urban area featuring restaurants, retailers, a marina, and boardwalk. Don’t miss the 160-story Burj Khalifa – the tallest building in the world as of 2018. This world-famous landmark is just eight minutes from Habtoor Palace. This commercial center is within easy reach and it’s certainly not just for corporate types. The district has offices, cafés, boutiques, sports facilities, and children’s play areas. Our concierge will book a tee time and arrange transportation to local golf courses.